Happy Monday, sweet friends! Did you have a good weekend? I hope so! This block is one of my absolute favorites in the whole book! There’s just something so playful about it. And the movement…buzzing up and down, back and forth, to & fro…I almost think it has a story to tell. Trails of fairy dust from the three fairies in Sleeping Beauty? I don’t know, but I love it! 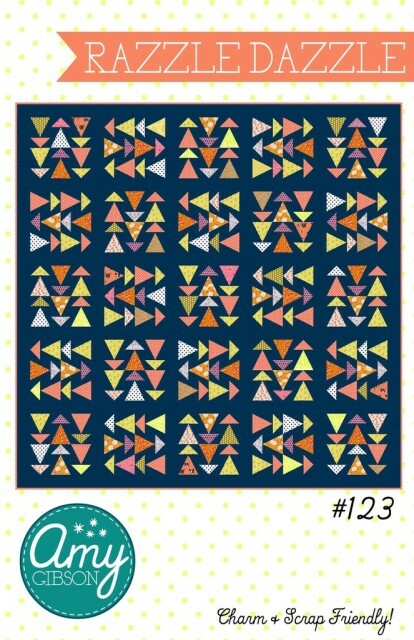 There’s actually a pattern in my shop inspired by this block- it’s called the Razzle Dazzle quilt. And it’s just perfect for charm squares! 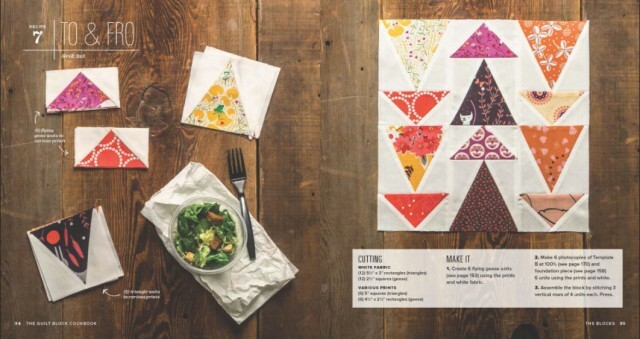 Friends, if you’re just tuning in, you’ll need to pick up a copy of The Quilt Block Cookbook to join in and make these blocks along with us. As of January 2017, the book has officially sold out, but you can still find copies for sale from third party sellers on Amazon, and possibly some local quilt shops and bookstores in your area. Looks like you all have been busy sewing! 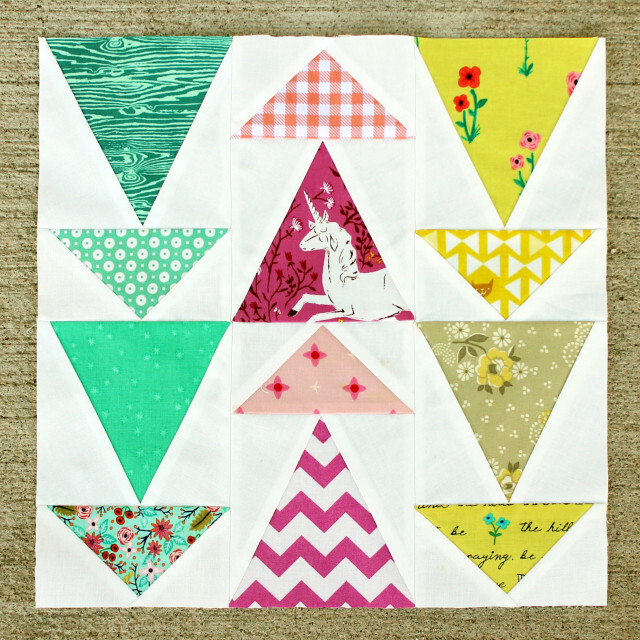 I’m seeing a ton of fabulous blocks popping up on Instagram! Be sure to add our hashtag so everyone can see your photo (and my apologies for any confusion- there is no “the” at the beginning of it). And if you have a blog, then grab a button to add to the sidebar of your website to let folks know you’re doing the Cookbook Quilt Along! And that’s this week! Happy quilting, everyone! Just have to share. 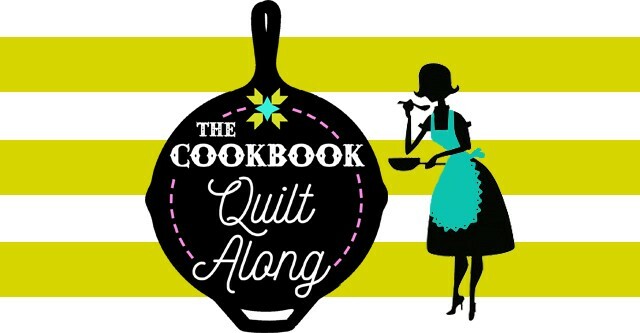 My husband surprised my with my copy of the Quilt Block Cookbook last week. I had it on my Christmas wish list but didn’t receive the book at that time. My husband told me that he did have one of the local quilt shops order the book prior to Christmas but it had only recently arrived. I was so excited to get the book that I was doing my happy dance and gushing thanks to my husband. Now to get some lovely fabric so I can put some blocks together. Thank you for putting together such an awesome book! Have you considered having a PDF download of the templates already at the varies sizes for those of us who have purchased the book. Making the copies of the templates directly from the book is not convenient or doable for me. ~ Thanks! I just tried to complete this block but found the fancy QST was considerable smaller than the bursts. Any suggestions? Amy – Enjoying all your creative ideas. In fact I am writing to ask your per mission to use the instructions for your to and fro quilt block. This would be for my B block exchange in our Eugene Moden Quilt Guild, each participant would access your website and then they can print the directions on their own. I am trying to be a lawful quilter regarding copyrights. The B Blocks that I get back will be for my own personal Use as a quilt for my Grandson. Hoping to get your permission in writing by your response to this comment. Thankyou!